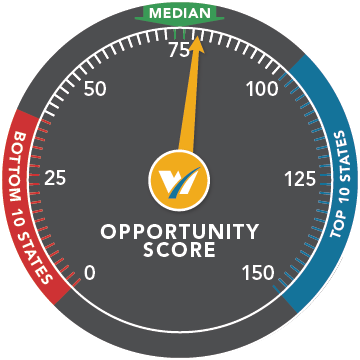 Welcome to the Washington Opportunity Scorecard! We’ve compiled independent data across 16 variables to score all 50 states based on performance against our core priorities of ACHIEVE, CONNECT and EMPLOY. 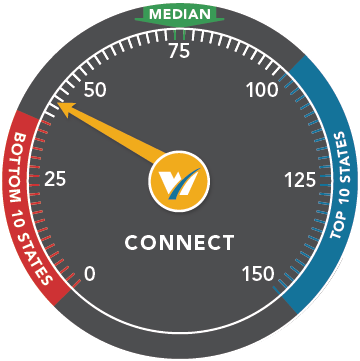 The dial is set so the score of the 10th best state is 100 and the median state is 75. Our goal is to make Washington a top 10 state overall in each category. Washington’s Performance: Washington moves up three spots and now ranks 22nd among all states with an overall Opportunity Score of 79. While Washington’s 50-state rankings on the three categories below did not change since the fall 2017 update, our state climbed due to improved scores on both Achieve and Connect. Top Performer: Utah continues to lead the nation with an Opportunity Score of 187. That state ranks 2nd in Achieve and 1st in Employ. Massachusetts, New Hampshire, Virginia, and Indiana round out the top five. Washington’s Performance: Our state again comes in 18th, although with a slightly higher Achieve score as compared to the most recent update. In 2017, the state improved its performance in 4th grade reading and 8th grade math. The high school graduation rate for the class of 2016 increased to 79.7 percent, from 78.2 percent for the class of 2015. Still, Washington ranks 42nd in the nation in this category. This metric, along with the four postsecondary metrics we track, will be essential to monitor as Washington works to increase postsecondary credential attainment among its students. Top Performer: Massachusetts holds on to its 1st place position. The Bay State outperforms Washington on the K-12 measures as well production of bachelor’s and advanced degrees per capita. Washington beats Massachusetts in associate’s degrees awarded per capita. The Data: Measures include 4th grade reading and 8th grade math proficiency; high school graduation rate; and associate’s, bachelor’s, STEM bachelor’s, master’s, and doctoral degrees awarded. Washington’s Performance: Our state remains at 39th in the Connect rankings, improving its score by four points since the fall of 2017. Washington made gains based on highway conditions, an indicator that should improve with the further implementation of the 2015 Connecting Washington transportation package. Washington is holding steady with 25.9 percent of bridges rated as structurally deficient. As of 2016, the average commute time in Washington is 27.8 minutes, the 20th longest statewide commute time in the country. Top Performer: Kansas takes the top spot with a Connect score of 112. Less than 16 percent of bridges in that state were rated structurall deficient as of December 2017 , compared to 26 percent in Washington. Kansas also has one of the lowest average statewide commute times in the nation (19.4 minutes). The Data: Measures of transportation system performance include commute times, bridge quality, and road quality. 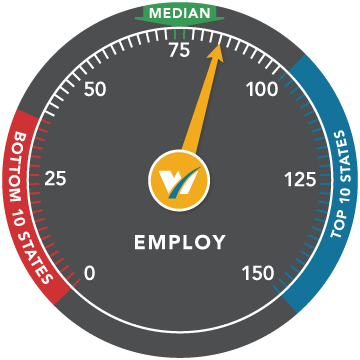 Washington’s Performance: Washington ranks 21st with an Employ score of 84. In the previous update, our state moved up nine spots, as a result of lower unemployment insurance taxes, higher levels of private sector R&D investment, and improved performance on both the Tax Climate Index and the Kauffman Growth Entrepreneurship Index. Top Performer: Utah remains in the top spot for Employ, with a score of 115. Business taxes per employee are about half as much in Utah ($4,000 per employee) as in Washington ($8,000 per employee). Massachusetts remains just behind Utah, and Virginia rounds out the top three. The Data: Indicators of economic vitality include two business tax measures, the UI tax, private sector R&D investment, and entrepreneurial activity.